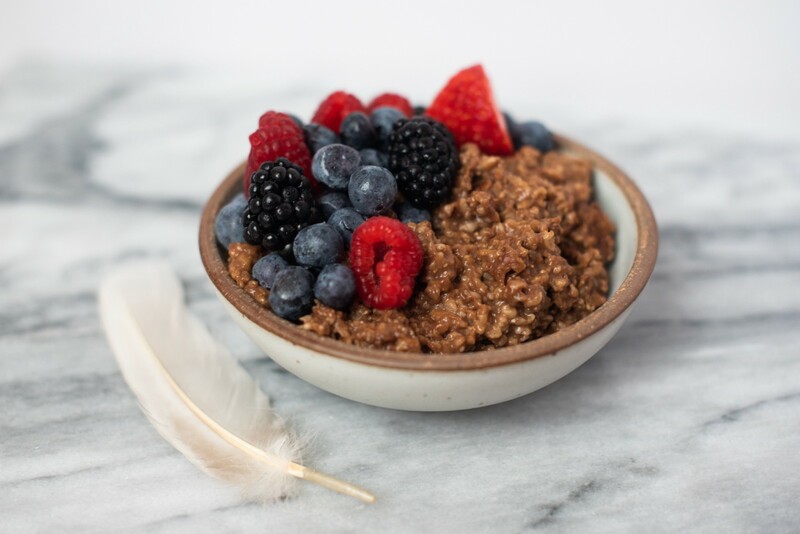 What better way to start the day than with a hearty bowl of moon cycle oats! Oats are one of our favorite breakfasts because they’re easy to prepare, full of good nutrients, and will hold you over until your next meal. This bowl of chocolatey goodness was made fresh, but you can also prepare your oats and leave them in the fridge overnight to grab and go in the morning! Our moon cycle steel cut oats are made extra delicious with our @cbdsuperfood Dark Chocolate Coconut Oil to offer rich chocolate flavor and support your body’s moon cycle. Incorporating cacao — the main ingredient in this @cbdsuperfood product — can help to reduce PMS symptoms like cramps. Cacao also contains anandamide, a neurotransmitter known as the “bliss molecule”, which can help balance and lift your mood. Support your body’s cycle and set a positive tone for the day with a bowl of chocolate oats! Bring water and salt to a boil. Add oats and simmer until soft. Remove from heat and add Dark Chocolate Coconut Oil, honey, and cinnamon. Place in bowl and top with berries of choice.